Bighelp provided 105 benches with writing planks, 10 office tables and 300meals plates to Zilla Parishad Secondary School Gudimalla, Khammam district. 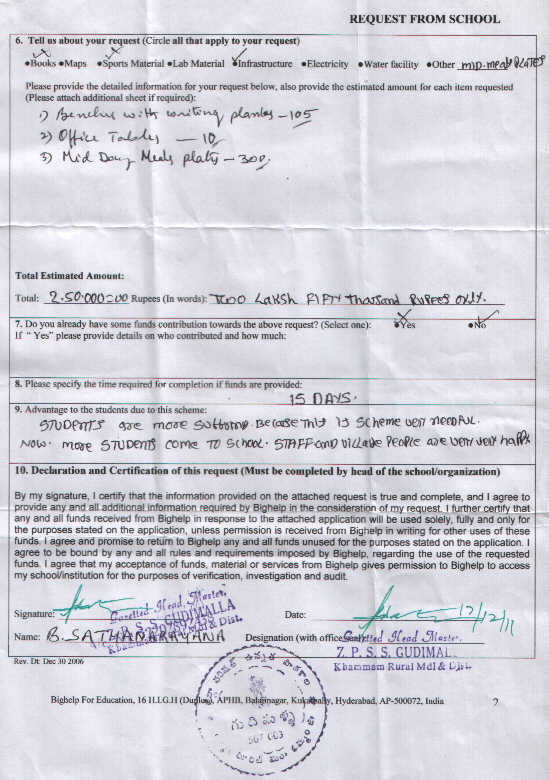 AIMS India Foundation approached Bighelp to execute the project in Z.P.S. School Gudimalla Khammam. Sri. 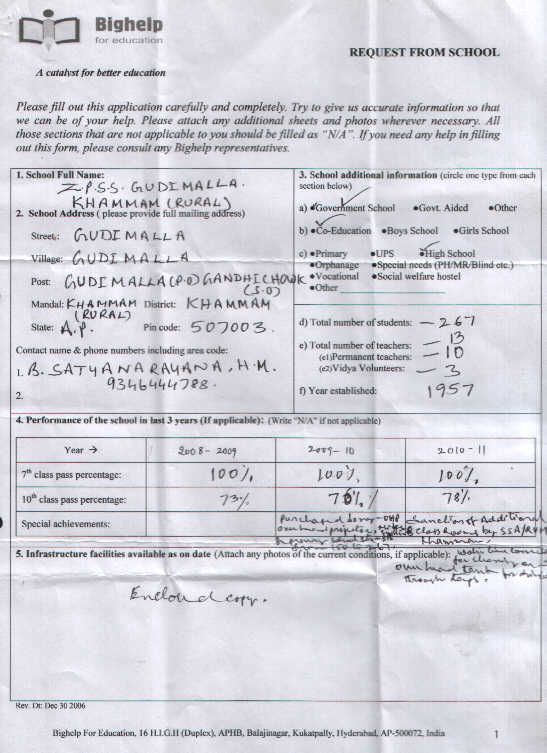 Satyanarayana Headmaster of the school requested Bighelp to provide infrastructure to the school. In his request he mentioned the students and teachers are facing difficulties in the classrooms due to insufficient seating arrangements. Hence he requested to provide 95 benches for high school, 10more benches to Primary school. 10office tables for teachers and 300 meals plates to the High school students to have their midday meals. Gudimalla is a village in Khammam rural mandal, Khammam district in A.P. It is 180 Kilometers away from state Capital Hyderabad. Khammam town district headquarter is connected both rail and road. The school was established in 1957. The strength of the school is 267 and coeducation. There are 10 permanent teachers and 3 vidya volunteers. At present the school is having 8 classrooms. Members of AIMS India Foundation approached Mr. Adithya Buddhavarapu Program coordinator of Bighelp to help in this regard. Mr. Adithya discussed with Sri. Chand Pasha Shaik Chairman Bighelp to consider the AIMS India Foundation request. Chairman gave his consent to execute the project with collaboration AIMS India.